9 May 2019, The John Rylands Library, Manchester, 6pm-7.30pm. (with a collection encounter and reception from 5pm). UPDATE 9 APRIL 2019: The event is now SOLD OUT but please do add your name to our waiting list on the Eventbrite page (link below)! Save the date! There are still many more Lives of Letters events this year ahead of us, but we are delighted to already announce a letter-themed poetry reading in May in the Historic Reading Room of the John Rylands Library (150 Deansgate, M3 3EH). We are delighted to host poets Leontia Flynn and Zaffar Kunial. Leontia Flynn has published four collections of poetry with Jonathan Cape. Winner of the AWB Vincent Literary Award in 2014, her most recent book, The Radio (2017), was described as “an outstanding book from a poet who is not only one of the best writers of her generation but who seems, more and more, to be the voice of that generation.” (The Irish Times) Shortlisted for the T.S. Eliot Prize, it won the Irish Times Poetry Prize. 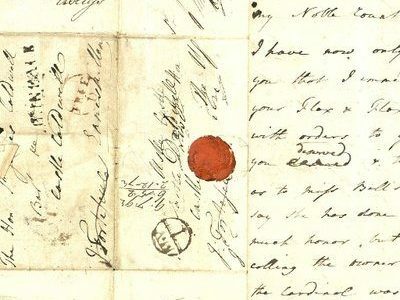 Please join us from 5pm at the John Rylands Library for a reception and collection encounter showcasing some of the most interesting letters held in the Special Collections at the University of Manchester Library. The poetry reading will start at 6pm. The event is FREE but places are limited, so please remember to book your place on our Eventbrite page. This event is organised in partnership with the Centre for New Writing. For more information, please contact Dr. Florence Impens at florence.impens[at]manchester.ac.uk.